This draft of ISO 13250-1 has been produced as a strawman in order facilitate a decision by the Working Group on what form this Part should take. The original proposal for a Part 1 was motivated by the perceived need for an introduction to the fundamental concepts of Topic Maps that could be read in isolation from the definition of the Data Model (which is the subject of Part 2). While there cannot be any doubt that the Data Model needs to be at the heart of the standard, it should also be recognized that most of the readers of 13250 will not be implementors. Those people need a clear presentation of the concepts that is not intermixed with data modelling concepts like item types and properties. Is there, in fact, a need for a formal, normative presentation of the fundamental concepts of Topic Maps, presented in isolation from the definition of the data model? Is it possible, by carefully moving some pieces of text that describe fundamental concepts from Part 2 to Part 1 (e.g. 5.5.1 and 5.5.2), to avoid unnecessary redundancy? Is there a need for an annex containing an informal tutorial, along the lines of that in the XTM specification? A decision not to include a separate presentation of the fundamental concepts will call the need for a separate Part 1 into question. The minutes of the Montreal meeting of WG3 recommended the editors to follow the model of ISO 8879, which includes a tutorial in Annex A. We wish to point out that this model is only partly relevant, since the annex in question actually contains a reprint of a rather old paper describing the general principles of generic markup, rather than a tutorial based on the standard. For the purpose of this strawman, we have simply copied the Gentle Introduction from the XTM Specification. If a decision is taken to include such a tutorial, we envisage a rewrite that contains more syntax examples and is more in line with the concepts as currently defined and understood by WG3. N.B. Since the current document is just a strawman, no attempt has been made to ensure that it follows the latest ISO rules in terms of document structure. International Standard ISO/IEC 13250-1 was prepared by Joint Technical Committee 1 JTC1, Information technology, Subcommittee SC34, Document description and processing languages. International Standard ISO/IEC 13250 Topic Maps consists of several parts. This Internal Standard ISO/IEC 13250-1 is included in it. A series of this standard provides definitions, requirements, and so on concerning Topic Maps. Topic maps enable multiple, concurrent views of sets of information objects. The structural nature of these views is unconstrained; they may reflect an object oriented approach, or they may be relational, hierarchical, ordered, unordered, or any combination of the foregoing. Moreover, an unlimited number of topic maps may be overlaid on a given set of information resources. Topic Maps realize the collocation of information about subjects. To qualify the content and/or data contained in information objects as topics to enable navigational tools such as indexes, cross-references, citation systems, or glossaries. To link topics together in such a way as to enable navigation between them. This capability can be used for virtual document assembly, and for creating thesaurus-like interfaces to corpora, knowledge bases, etc. To filter an information set to create views adapted to specific users or purposes. For example, such filtering can aid in the management of multilingual documents, management of access modes depending on security criteria, delivery of partial views depending on user profiles and/or knowledge domains, etc. To structure unstructured information objects, or to facilitate the creation of topic-oriented user interfaces that provide the effect of merging unstructured information bases with structured ones. 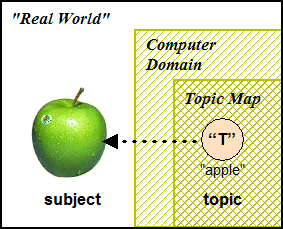 The overlay mechanism of topic maps can be considered as a kind of external markup mechanism, in the sense that an arbitrary structure is imposed on the information without altering its original form. This International Standard does not require or disallow the use of any scheme for addressing information objects. Except for the requirement that topic map documents themselves be expressed using XML (or WebSGML), using the syntax described herein, neither does it require or disallow the use of any notation used to express information. This clause defines the scope of this International standard. It should not be confused with the concept of "scope" defined in 13250-2, which only applies in the context of Topic Maps. ISO/IEC 13250 Topic Maps consists of the following parts. This Part of the International Standard provides an overview of each part and how the parts fit together. It also describes and defines the fundamental concepts of Topic Maps. Look at ISO 10303, where Part 1 also presents Fundamental Concepts, in order to see how it might be done in this standard. Status of HyTM and Reference Model as parts of ISO 13250 has not yet been clarified. The following text has been taken from the Roadmap document. The editors request feedback on the level of detail required in this overview. ISO/IEC 13250-1 provides an overview of each part and how the parts fit together. It also describes and defines the fundamental concepts of Topic Maps. ISO/IEC 13250-2 specifies a data model for topic maps. It defines the abstract structure of topic maps, using the information set formalism, and to some extent their interpretation, using prose. The rules for merging in topic maps are also defined, as are some fundamental published subjects. ISO/IEC 13250-3 defines the XML Topic Maps 1.1 (XTM) interchange syntax for topic maps, a syntax based on XML, XLink, and URIs. The allowed syntactical expressions in XTM documents are constrained using a DTD and prose, and their interpretation is defined using 13250-2. Note that this is only a syntax specification; what the syntax represents is defined by 13250-2. ISO/IEC 13250-3 will replace [XTM1.0] as the official definition of the XTM syntax once it is adopted by ISO as part of the revised ISO 13250 standard. 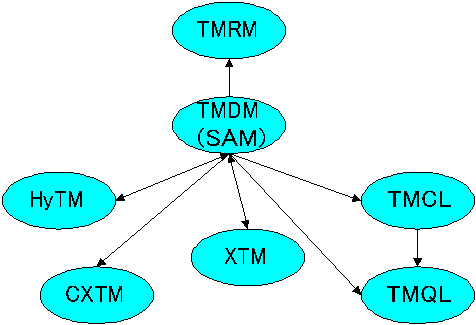 ISO/IEC 13250-4 defines the HyTime Topic Maps (HyTM)) interchange syntax for topic maps, a syntax based on SGML and HyTime. ISO/IEC 13250-5 defines a means to express a topic map processed according to the processing rules defined in ISO 13250-2: Topic Maps -- Data Model in a canonical form. The canonicalisation is based on the model defined by ISO 13250-2 and henceforth referred to as the Topic Maps Data Model. Such a canonical form enable the instance of the Topic Maps Data Model constructed by one topic map processor to be directly compared to that constructed by another topic map processor. Canonicalisation is the process by which a data model is reduced to a serialised form such that two logically equivalent data model instances result in an identical byte-by-byte serialization. ISO/IEC 13250-6 provides a basis for evaluating syntaxes and data models for Topic Maps, including but not limited to those specified by 13250-2, 13250-3, 13250-4, and 13250-5, in terms of their ability to arrive at one proxy for each unique subject. The state of having one proxy for each unique subject, also known as the "Subject Location Uniqueness Objective," is an objective for only some subjects in any given data model or syntax. ISO/IEC 13250-6 makes the underlying abstraction of Topic Maps explicit and does not extend or limit another part of ISO/IEC 13250. The relationship of each part and how they fit together is shown in the figure below. Redraw graphic to distinguish between 13250, 18047 and 19756. (Uses different arrow types to distinguish between dependencies and data flow?) Status of RM and HyTM? Any piece of information can be said to be "about" one or more subjects. At the heart of the Topic Maps paradigm is the notion that the most effective way of organizing information - at least for most purposes - is around those subjects. A subject can be an individual, like Isaac Newton, the apple that fell on his head, or a document (such as this one); it may be a class of individuals, like scientists, fruits, or ISO standards; it may also be a more abstract concept like gravity or inevitability. In short, a subject can be any subject of discourse that an author wishes to identify, name, represent, or otherwise make assertions about. Anything whatsoever, regardless of whether it exists or has any other specific characteristics, about which anything whatsoever may be asserted by any means whatsoever. Applications deal with subjects through formal representations using symbols as proxies. 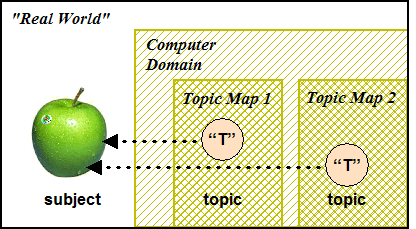 In Topic Maps such proxies are called topics. A topic is thus the representation, inside some application, of a unique, clearly identified, and non-ambiguous subject. A symbol used within a topic map to represent a subject. A topic map is a collection of topics and statements made about the subjects they represent. By definition every topic represents a single subject (although that subject may itself consist of other subjects, as in "The members of the United Nations"). A subject, on the other hand, may be represented by more than one topic. This is often the case with multiple topic maps that cover the same universe of discourse. However, within a single topic map, the goal is that there should be only one topic per subject, in order to ensure that everything that is known about a given subject is available from a single location (i.e., topic) within that map. This goal is called the collocation objective. The collocation objective also applies when two topic maps are merged. Topics that represent the same subject must be merged to a single topic, which has the union of the characteristics of the original topics. To make it possible to achieve the collocation objective, Topic Maps provides very specific mechanisms for establishing the identity of subjects. Subject identity is a set of properties of a topic that enable applications (and humans) to know which subject the topic represents and, in particular, to know when two topics represent the same subject and must therefore be merged. Because it is concerned with information management, Topic Maps recognizes a fundamental ontological distinction between "subjects in general" and a particular subset of subjects, namely information resources, such as documents. A resource that can be represented as a sequence of bytes and thus could potentially be retrieved over a network. The distinguishing property of information resources vis-à-vis any other kind of subject is that they have a location within some network and thus an address which can be used to uniquely identify them. All other subjects are non-network retrievable and do not have addresses. 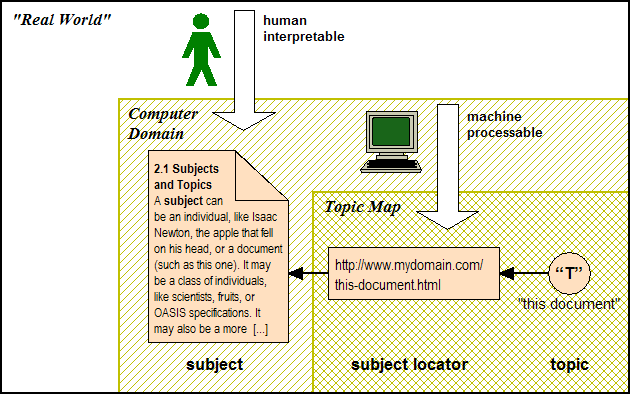 In recognition of the distinction between addressable subjects (i.e., information resources) and subjects in general (i.e., information resources and non-addressable subjects), Topic Maps provides two mechanisms for specifying subject identity, both of which use locators. A subject locator is used to identify an information resource directly via its address. A locator that refers to an information resource that is the subject of a topic. Subjects that are "outside the system" and thus cannot be identified directly can be identified indirectly via a subject indicator. An information resource that indicates the identity of a subject to a human being. A subject indicator can be any kind of information resource that can be interpreted by a human and that provides sufficient indication of the identity of a subject to be able to distinguish it from other subjects for the purpose of some application. Since a subject indicator is an information resource, it has an address that can be used as a subject identifier. A locator that refers to a subject indicator. Locators can thus be used in one of two ways to identify a subject: directly, as a subject locator, and indirectly, as a subject identifier. In Topic Maps it is always clear, both in the data model and in conforming syntaxes, when a locator is being used in one or the other of these roles, and when it is simply being used as a locator. For various subjects  for example, William Shakespeare, Ben Jonson, their plays Hamlet and Volpone , and the towns of London and Stratford, among thousands of others  we will wish to record all of the locations in the encyclopedia  whether passages of text, or images, or sound recordings in a multi-media encyclopedia  where they are discussed, depicted, or mentioned. We will speak of these locations as occurrences of these subjects. Note that different occurrences may relate to their subject in very different ways, which we would like to distinguish. In-depth discussions, brief mentions, and illustrations may need to be distinguished in order to allow the users to find more quickly what they need. The playwrights William Shakespeare and Ben Jonson, by contrast, are not addressable resources: they are not electronic artifacts at all, but real human beings. 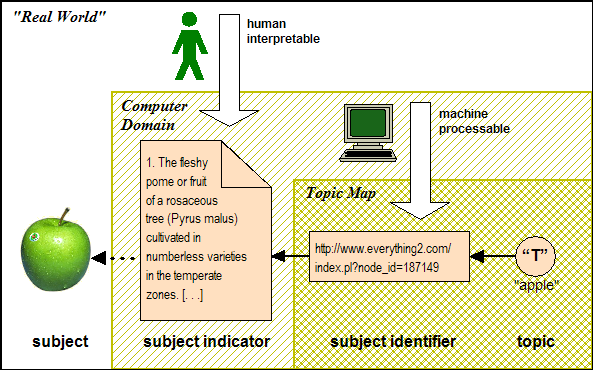 In order to represent the link between an occurrence of a subject and the subject itself, we would like simply to point to each in turn and say this location discusses this subject (or perform the equivalent gestures in some electronic notation, by giving the address of the subject, the address of the occurrence, and describing the relation between them using markup). Because not all subjects are electronic artifacts, however, we cannot provide an address for the subject. Instead, we provide an electronic surrogate for the subject, which (being electronic) can have an address. This surrogate we call a topic. Every topic acts as a surrogate for some subject. We say that the topic reifies the subject  or makes the subject real for the system. The creation of a topic that reifies a subject enables the system to manipulate, process, and assign characteristics to the subject by manipulating, processing, and assigning characteristics to the topic that reifies it. When we need an address for the subject, we give the address of a topic which reifies it, and acts as its surrogate within the system. Note: For brevity, examples of URIs in this specification sometimes include only a fragment identifier (e.g. #play above). In such cases, it is assumed that these identifiers refer to a <topic> element elsewhere in the same topic map with an id attribute value that matches the fragment identifier. Because associations express relationships they are inherently multidirectional: If  Hamlet was written by Shakespeare, it automatically follows that Shakespeare wrote Hamlet ; it is one and the same relationship expressed in slightly different ways. Instead of directionality, associations use roles to distinguish between the various forms of involvement members have in them. Thus the example above may be serialized using natural language as follows: There exists a 'written by' relationship between Shakespeare (playing the role of 'author') and Hamlet (playing the role of 'work'). Relationships may involve one, two, or more roles.